1. Cook the rice according to pack instructions, then drain and set aside. 2. Meanwhile, place the mackerel on a shallow baking tray lined with foil and grill for 5 minutes on each side until cooked through. 3. Spritz a wok with oil and stir-fry the ginger, garlic and chilli for 1 minute. Add the vegetables and stir-fry for 2 minutes.Add the sauce and cook for another couple of minutes until the vegetables are tender and the sauce is piping hot. 4. Divide the rice between two plates. 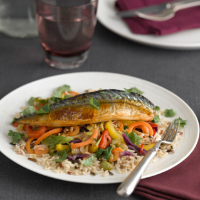 Top with the vegetables and the mackerel fillets. Scatter over the coriander and serve.